The Loveland Schools Transportation Department has launched a District-wide initiative to benefit Loveland children. The goal of “Stuff-a-Bus” is to collect a school bus full of fun, healthy and kid-friendly foods through donations to support children in need throughout the Loveland community. Delivery to the L.I.F.E. 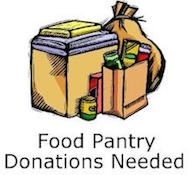 Food Pantry is targeted for Saturday, October 6. Donations can be sent with students to school or dropped off at any Loveland school campus.